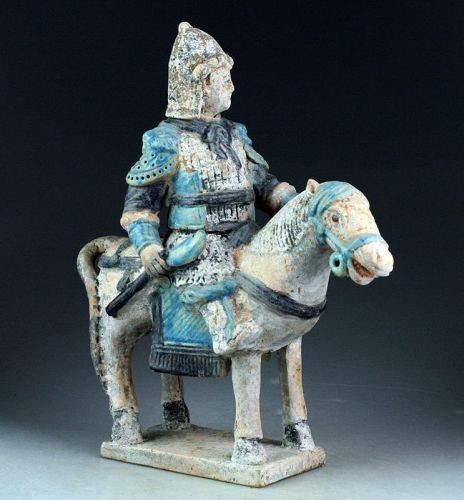 Beautiful Chinese Ming Tomb pottery figure of horseman carrying a Mace, dating to the Ming Dynasty 1368-1644 AD. 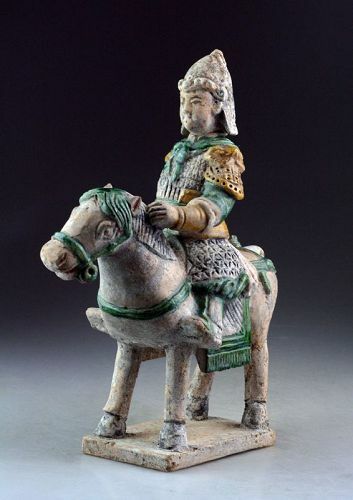 A scarce and beautiful Chinese pottery tomb figure of a female horserider. An attendant on horseback carrying a small child in her arm. A nice selection of three antique Opiumweights, denominal 5 Ticals, (weight approx 80, 81 and 71 grams), Burmese, types dating from ca. 1780-1850. Nice Hintha birds with fine brown patinas. 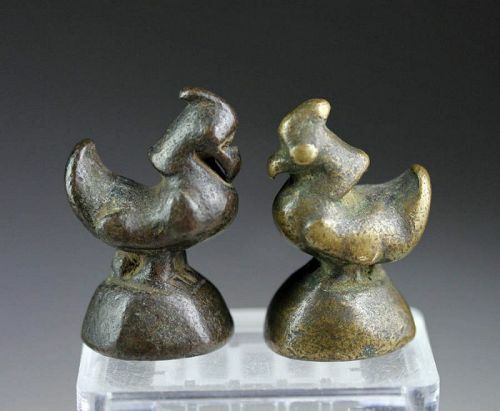 Fine pair of two bronze Opium weigts, Burmese, ca. 18th. century! A pair of earlier Opium weights, denominal 10 Ticals, (weight approx 160 grams and 152 grams), Burma, late 18th. century. Nice Hintha birds of a good size, with fine brown patinas. Both on Hexagonal bases one stepped and one decorated on top. 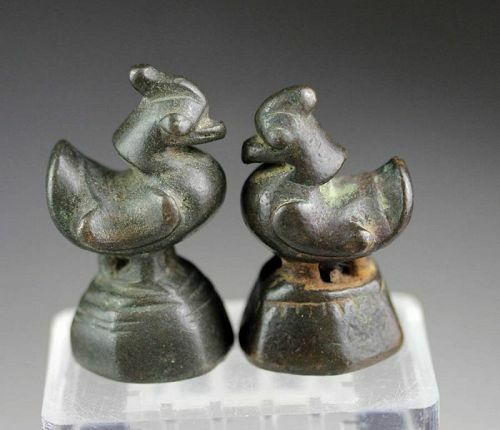 Fine pair of two bronze Opium weigts, Burmese, 19th. century! A pair of wonderfully detailed Opiumweights, denominal 10 Ticals, (weight approx 160 grams and 165 grams), Burma, prior to 1850. 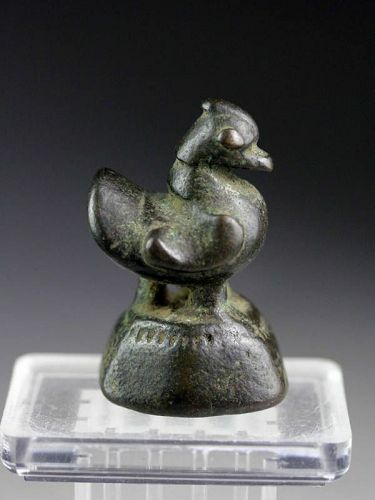 A finely patinated bronze weight of an early type, Burmese 1785-1802 AD. The design with short vertical lines on the base (almost worn smooth), single head crest, hexagonal shaped base and U-shaped tail. Size: 6,4 cm. Weight: 288 grams. Condition: Choice, smooth wear and fine light brown patina. 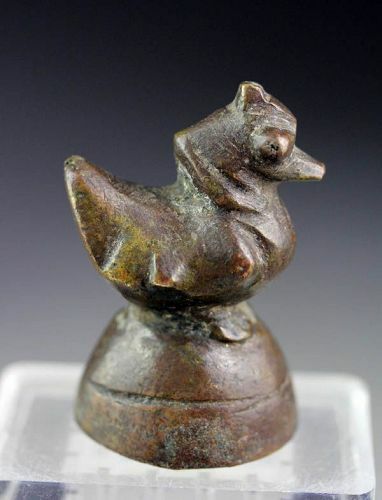 A finely light brown patinated bronze weight of an early type, Burmese 1785-1802 AD. 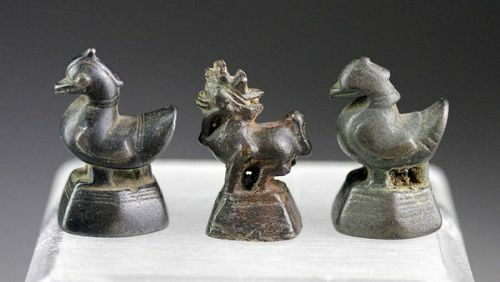 The design is with a downturned curved beak of the Bird, short vertical lines on the base (almost worn smooth), single head crest, hexagonal shaped base and U-shaped tail. Size: 6,4 cm. Weight: 294 grams. Choice Burmese 20 Tical Opium weight, ca. 330 grams! Fine massive Hintha bird, Burmese dating to ca. 1820-1850 AD. Condition: Choice! 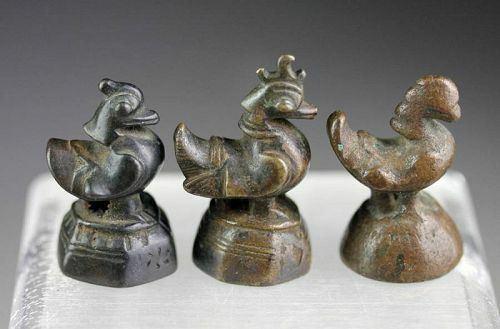 Very attractive brown bronze patina, fine smooth wear but still in very good condition. 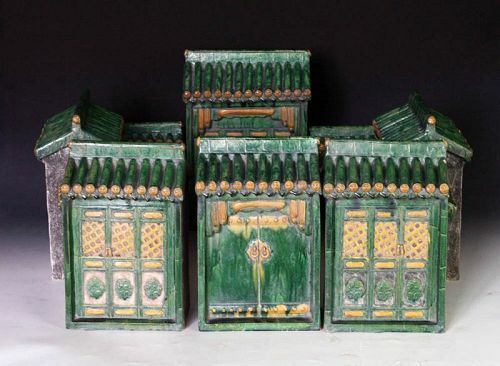 Beautiful set of 2 Ming Dynasty pottery attendants. Rare Types! 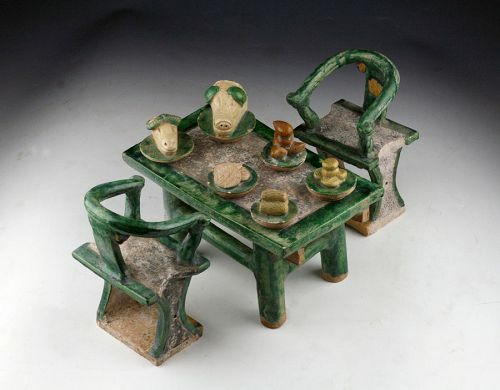 A set of 2 Chinese pottery tomb figures, depicting attendants and dating to Ming Dynasty, 1368-1644 AD. 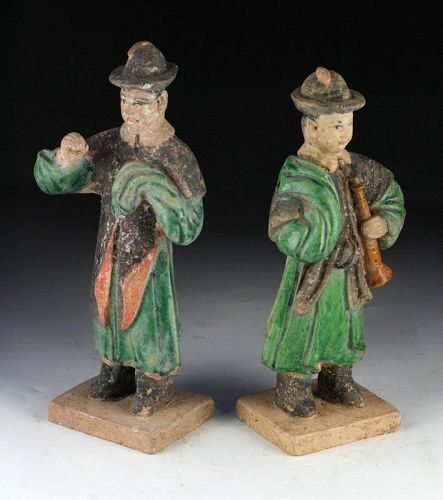 One of the figures holds a flute, they both wear peculiar hats. Finely coloured robes in green and black and pigments on their faces. Size: ca. 23 cm in height. Very decorative figures of a type, we haven't met before. Condition: Choice, intact and in very good condition for the type. Guaranteed authentic and comes with our COA.